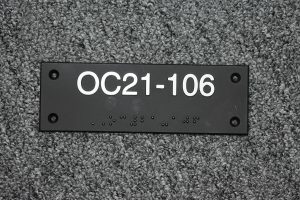 Our stock and custom ADA signs help you easily comply with the American with Disabilities Act. Choose from stock colors and sizes or let us help you custom design your ADA signage to perfectly compliment your environment. Distinct shapes, pantone color matching and metal or plastic holders are just a few of the options available to make your ADA signage match seamlessly with your décor. Questions? Email sales@granitestatestamps.com for more details. Click here to view and download ADA Signage Regulations information.